Game of Thrones premiered on HBO received popularity and positive appraisal from audience, also some critical acclaims, but theses has nothing to do with its viewability. You may be deeply attracted and also have some doubts after viewing, so it is worth of watching again in some way. Here we talk about how to download Game of Thrones series from online sites to your computer for offline watching or casting series you downloaded to TV console or mobile phone for enjoying. Game of Thrones series is available on many online video sharing sites like YouTube, Vimeo, Dailymotion etc. So here Any Video Converter Freeware is highly-recommended to download Game of Thrones Series for playback offline on computer or mobile devices. Step 2: Go to sites like YouTube/Dailymotion/Vimeo and search for the Game of Thrones series you want to download, then copy the episodes URLs. Step 3: Run Any Video Converter and click on the Add URLs button, then a dialog will pop up, just click icon, and paste the download link to it. You can continue to paste more links as the previous steps. Tips: The default output format is HD MP4, and if you want to download Game of Thrones series as other formats, please press Online Video Tab, then simply choose Manually Select under Select Format before downloading, thus you can choose the video format such as HD, MP4, 3GP etc. And downloading Game of Thrones tracks is also supported by Any Video Converter. 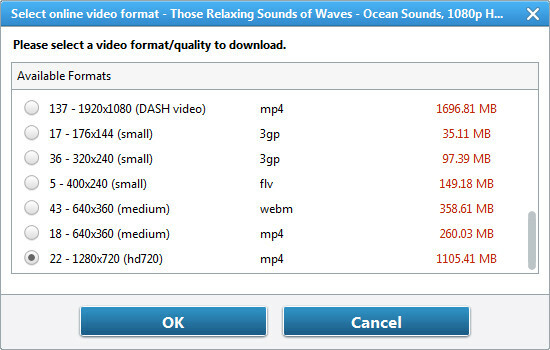 Step 4: after choosing the video format, press Start Download! button and click "OK" to start downloading Game of Thrones series to the formats you want. And you also can convert the videos to the formats supported by Android, iPhone, iPad, PS4 etc. All the 7 seasons are also available on iTunes for purchase. Offline playback on iTunes is permitted after purchasing Game of Thrones Series, and if you want to stream all the series to TV or game console, mobile phones for offline watching, it sounds not easy because of the DRM protection limitations, but things will be easier if the DRM protection can be ripped legally and M4V videos can be turned into formal formats like MP4. NoteBuner M4V Converter Plus must be the one you are looking for iTunes media solution. It is a professional DRM removal tool for windows and Mac users to strip DRM protection from iTunes purchased and rented M4V movies, TV shows and other iTunes videos, and convert iTunes M4V to unprotected video formats like Lossless MP4, Lossless MOV etc for playing on portable media player, smartphones, tablets, etc. There are also other more sources to download and watch Game of Thrones series, and here we shares these 2 ways often-used by us and these might be useful for you to download and watch the series offline. Welcome to share more ways you know for us Game of Thrones fans.